The iPhone heart rate monitor prototype by Corventis will of course be useful by people who actually need to keep track of their heart health, but it could actually be used as a unique physical input device for apps. 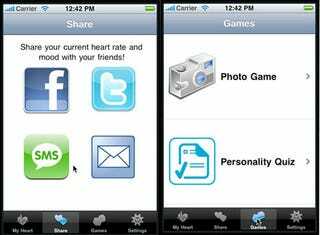 Fast Company says that the heart app can shoot your heart rate over social networks, meaning that people can try and send you photos (imagine your favorite gross-out surprise picture) to try to get your heartrate up. The winner would be the one who could make your heart jump the most.